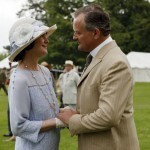 Home » Drama » Downton Abbey’s 7 Best Couples…so far! The best (and only) thing about America being in the home stretch of the final series of Downton Abbey is that it gives us the ability to look back on a series that, for six years, has given us some of the best television on television. Once again, a huge tip of the hat goes to the great folks over at PBS Masterpiece, for this look at Downton Abbey‘s 7 Best Couples…just in time for Valentine’s Day. Of course, this list might be a bit premature given it is based on 5 series and some change. There are still 3 more episodes remaining counting tonight’s episode. Plenty of time remaining for a possible Isobel Crawley/Lord Merton late night entry, a Henry Talbot/Lady Mary hook-up or even a Bertie/Edith entry. 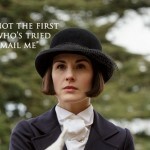 One can only imagine the look Lady Mary would give the suddenly more in demand Lady Edith should she occupy two spots in the ‘Best Couples of Downton Abbey‘ scenario! Origin story: In a sudden rainstorm, the two strangers met; he held the umbrella and she stole his heart. Most Romantic Moment: The above-mentioned rainstorm meeting. Love at first sight! Why We Love Them: Young love between beautiful idealistic people ready to take on the world side-by-side, like Romeo & Juliet, with a happy ending? What’s not to love? Legacy: Maybe, if fortune smiles on them, adorable multi-faith offspring! Origin story: As the magazine editor who offered Edith her own column, Michael Gregson was the first to recognize her talent and the first to show her the love she deserved. Why We Love Them: She was abandoned at the altar; he was trapped in a marriage to an insane woman—could these two suffering lonely hearts possibly deserve happiness more? Legacy: A broken heart, a fatherless lovechild, Marigold, but also a swanky apartment and a magazine to run. Origin story: The American “buccaneer” Cora was married off to Robert in order to shore up the financial position of Downton Abbey. 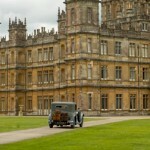 But what began as a sort of transaction transformed into the foundation of Downton Abbey itself. Why We Love Them: The realness of their relationship, their partnership, and their love for their daughters. Legacy: Daughters, grandchildren, and a still-viable estate. Origin story: Through the years, over sherry in the butler’s pantry, the two have clashed, conferred, considered, and relaxed into a true intimacy that culminated in love. Why We Love Them: The glacial pace of courtship, the knowledge that they will grow old together, and the comedy of these two stubborn personalities navigating love and clashing over cooking! Legacy: Companionship, comfort, and common goals. Origin story: Gestures of kindness in the face of vulnerability led to stolen glances, compassion, and finally the recognition that these unlikely soulmates must yield to—and fight for—their love. Why We Love Them: The slow-burn romance, the unequivocal loyalty, the shared strong moral values, and the compassionate devotion. Legacy: With some richly-deserved luck, a baby Bates! Origin story: The socialist chauffeur and the liberal lady were drawn together over politics, which soon transformed to passion. Basically, we have the harem pants to thank! Most Romantic Moment: After Branson flees Ireland and leaves Sybil behind—possibly “languishing in a dungeon somewhere in Dublin”—pregnant Sybil arrives home to Downton and Tom, who begs her forgiveness and kisses her with passion. Why We Love Them: Their courage, their kindness, their principles, and their star-crossed, tragic end. Legacy: Sybbie, a well-run estate, and the memory of kindness and love. Origin story: Matthew was the (perceived) middle class inheritance usurper, and Mary was the (perceived) rude and icy snob. Pushed toward a union of convenience, both resisted until…friendship developed, and then love. And then the drama really kicked in! Why We Love Them: The will-they-won’t-they, the opposites-attract, and the fact that in spite of it all, they were meant for each other. 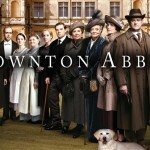 ‘Downton Abbey’ to end after series 6? Say it isn’t so, Julian.